Welcome to our new, improved weekly newsletter! Each week, our team will provide analysis from the Hill and state legislatures, ways you can take action, and things to fill your ❤️️ from around our movement. It seems like we just got out of the last government shutdown, the longest in history. But if Congress doesn’t act quickly, we’re just 11 days away from the next one. Your  sustained  activism  led to the #TrumpShutdown ending with no new money for Trump’s racist wall. That’s the energy we have to keep up this week and next to make sure that Trump’s agenda of hate stays out of legislation to fund the government. Meanwhile, Democrats continue to move forward with an affirmative agenda in the House. You may remember from our new guide, Indivisible on Offense, that Democrats now control oversight committees in the House of Representatives that are tasked with taking on proactive work: launching investigations, holding hearings, marking up legislation, etc. This week is F U L L of committee activities, including hearings on H.R. 1, oversight on family separation and ACA sabotage, a mark-up of the Yemen war powers resolution (which we support!) and more. Check out our policy experts’ tweets on this week’s hearings. Trump continues to threaten to declare a fake emergency to get his way on the border wall, making a mockery of real national security emergencies and taking us another step toward authoritarianism. The administration just pulled the US out of the Intermediate-Range Nuclear Forces (INF) treaty, in a giant gift to Russia and striking another blow to international institutions and partnerships. By recognizing opposition leader Guaido as president of Venezuela instead of elected (through dubious and corrupt processes) president Maduro, the Trump administration raised fears the US could return to its ugly history of military intervention in Latin America, making bad situations worse. We’re keeping a running list of all the ways he’s making us less safe -- read up here. Call both Senators and your House member about the DHS conference bill. Tell them: stay strong, reject any new money for the wall, ICE, or CBP. Has your House Democrat co-sponsored H.R. 1? Check here. If not, tell them to co-sponsor the bill now! How hard is your MoC working to hold the Trump administration accountable? Refresh your memory on oversight responsibility in our new Indivisible guide and then check video from this week’s hearings (on the committees’ websites) to see how they did. This THURSDAY 2/7! Join our Co-Executive Directors Leah Greenberg and Ezra Levin for our first Facebook Live of 2019 at 5pm ET/2pm PT. Like us on Facebook and you’ll get notified when we go live! Also on Thursday! RSVP now for our February activist call this Thursday at 8pm ET/5pm PT. Our organizing and policy teams will walk you through what’s going on in the conference committee and how to plan for our day of action on Monday, February 11! Showing events near: 95818. Wrong zip code? Update it here. After the election, we released Indivisible States, a guide to empower Indivisibles across the country to take their constituent power to their state house. And Indivisibles in Arizona, Colorado, Connecticut, Massachusetts, and New York are already putting the guide into action! Read Indivisible States to help you get started on taking the fight to your state! 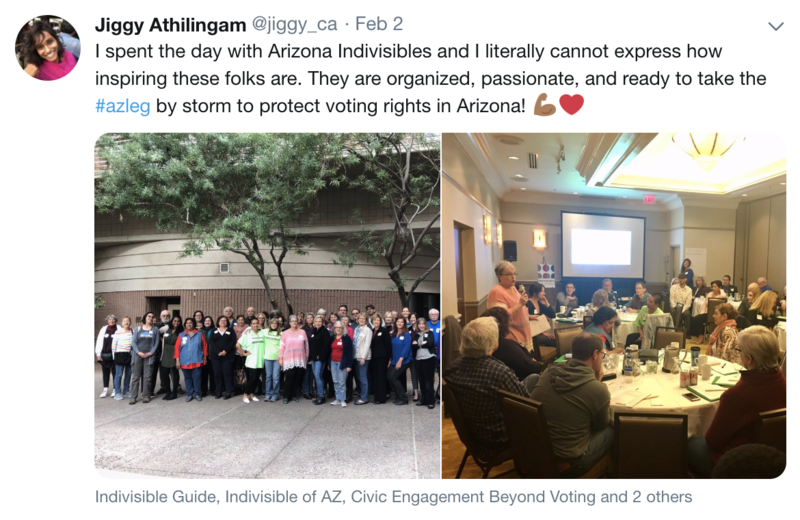 This weekend, Indivisibles from across Arizona came together for the first-ever statewide convening. More than 50 leaders from across the state to talk about bills going through the state legislature, partnering with other statewide coalitions, and coming together to battle bad bills moving in statehouse. As they return home, they’re fired up to get to work fighting anti-democracy bills flying through the state legislature this week. Click here to view this email in your browser or here to forward this email to a friend. This email was sent to emc63@sbcglobal.net at zip code 95818. Update your contact information here. You may unsubscribe at any time.